A few people have asked about the drop angle calculation and what the numbers mean. 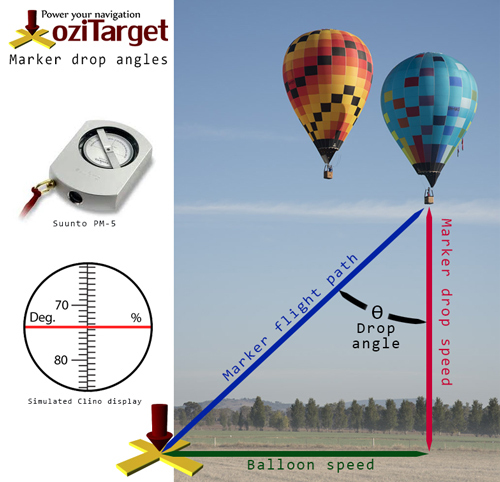 So lets look at what the marker drop angle is all about and how to use a clino for a high drop. The need for high marker drops is fading out a little with the use of loggers and the small MMA's around targets. That said, there are still going to be times when a clino will help you drop from 600 feet up very accurately into a 50m MMA if that is the only height you can approach it. A clinometer of some description. I use the Suunto one here or at least an earlier version of it. A clino is used to measure the angle from horizontal or vertical. Most will have two scales, degrees and Percent. On mine the Degrees are on the left side and that is all I read. Also, some models will have 0 degrees as down or 90 degrees as down. I use one with 90 Degrees down. oziTarget can be adjusted to work with either in the settings. You sight through the clino at your target like you would a sighting compass except that the clino is held vertically to give you a reading. I always sight straight down first to confirm I am seeing 90 degrees down then pan up to my goal for the reading. First of all, in using a clino we are making some assumptions about the rate that a marker falls at and the effects that the various wind directions if falls through will have on the forward speed of the marker. In oziTarget you can set the marker speed to any value that works for you. The default is 2100 ft/min which I have found to be accurate enough for me and has achieved sub 20m results from thousands of feet up. How much of that was good luck or good management is up to the viewer but I took the points and was happy I had a clino on the day. The reality is that a marker probably falls faster than this but there are a few factors to consider such as acceleration time to get to the terminal velocity of the marker (about 1 second) and my (or your) ability to spot a point on the ground through a clino and release the marker at the appropriate moment. Add in variations in the air column the marker is moving through, the fact you rarely are excited about letting go of a marker at height and you quickly see that practice is everything, especially now we have little Marker Measuring Areas and 3D scoring to contend with. A high drop just became a whole lot more risky. This is basic trigonometry in that we are making a triangle where the vertical side is the marker speed and the horizontal is the balloon speed. We assume the marker vertical speed is constant and also assume that the forward speed of the balloon is retained by the marker for the duration of the drop. The beauty of this is that we do not need to know the ground height or the distances involved. You can pick any point in your flight direction and use that as your target and know that the marker will land pretty damn close to it. Note: you are sighting in the direction you are flying because that is pretty much where the marker will go. If the target is 500m off to your right then you are aiming for the closest point that you will pass the target - See the transit point function in oziTarget to work out where that point is. It is all about how long the marker is falling and how big the variations are. Some days you will get caught out and practice is everything because you will need to fudge those angles in some situations. For example, I find that if I am dropping from around 200 feet up I need to think more about what that bottom layer of wind is doing. If I am doing 20km/h but most of the air the marker will travel through is dead calm then the drop angle needs to be increased to compensate. How much is what you need to practice and combine with your own judgment and experience in dropping markers. Thanks to Andrew Roberston for this series of clips of him using a clino on a range of gravity drops that show how it works. It gives you a good idea of how much guess work is removed.